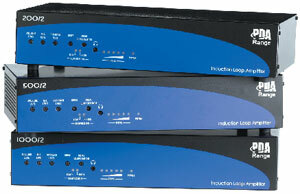 View details on the PDA Pro-Range Professional Induction Loop Amplifiers below or download the specification sheet. SigNET's new range of professional current mode audio-frequency induction loop amplifiers offer outstanding sound quality at a competitive price. They are ideal for use in large prestigious applications such as theatres, churches, cathedrals, cinemas, large conference halls, etc., where first class sound and unrivalled reliability are a must. Each amplifier includes one balanced microphone input and one switchable balanced mic. or line level input, both of which will ccept standard 3 pin XLR connectors. Optional 11V phantom power is also available on both inputs to allow the use of electret or condenser microphones. By popular demand, each amplifier also features a four-way 'Outreach' input offering full compatibility with SigNET's unique Outreach Plate audio input extension system. This system allows the connection of up to 10 additional microphone or line level inputs via a range of specially designed single gang connector plates. Other features include three level controls (one for each input), a loop drive control, an output current meter and a 'compression' activity display giving visible indication of the amplifier's compressor. PDA Pro-Range amplifiers are fully compatible with SigNET's unique 'Outreach Plate' audio input extension system. This system allows the connection of multiple microphone or line level inputs via a range of specially designed single gang connector plates covering the most common variants of audio connector including XLR line, XLR mic., 3.5mm jack, dual phono and 1/4” jack. A maximum of 10 plates (any mix) can be daisychained to the amplifier's Outreach socket using standard two pair audio cable such as Belden 8723. Compression: A two LED display is provided for indication of signal compression. The first LED shows the beginning of compression whilst the second indicates very high compression levels have been reached. On/Off switch incorporated into IEC mains inlet. Four way piano key style DIP switch selects Phantom power for mic 1 & 2 XLR inputs and switches XLR input 1 between Line and Microphone settings. The fourth of the 4-in-line switch is not connected. Level controls for XLR 1 (Line/Mic switchable), XLR 2 (Mic) and Outreach. These can be used individually or any of them together, in which case they act as a three input mixer. Drive control: Sets the level of amplifier output current supplied by the amplifier. Metal compensation control. When fully anti-clockwise has no effect on the signal. When turned clockwise imparts a rising 3dB/octave characteristic to the frequency response of the amp to counteract the effect of metal in proximity to the loop. The PDA1000/2 and PDA500/2 have thermostatically controlled cooling fans, which are activated when the amplifier’s internal heatsink temperature reaches approx. 56oC. The PDA200/2 model does not require a cooling fan, as it does not generate as much heat as the larger models.